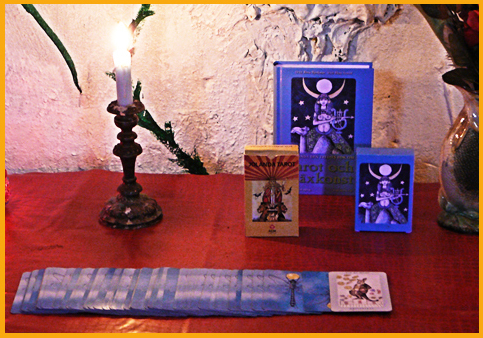 Jolanda Tarot or formerly Jolanda the Third's Book on Tarot and Magic, "The Art of Magic", written by Rosie Björkman. (The book will soon be available in english.) 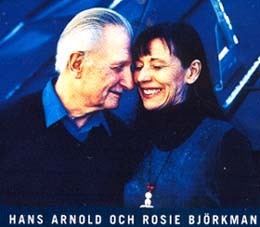 Rosie is also the initiator and co-creator of the Jolanda Tarot tarot-deck.The Tarotcards are illustrated by Hans Arnold, a well renowned artist in Sweden. The reader is treated with a glimmering rainbowmix of knowledge from many varied souces: Deprak Chopra, Aleister Crowley, Carlos Castaneda, Florinda Donner, Vicky Noble, and so forth. One of the major sources in the book is a north-american native shaman tradition called Sweet Medicine, which is an alternative healing art that includes the presence of spirit in all created on earth. Each card is coupled with an exercise, a meditation of sorts, that will help with the understanding of the energies of the card on an even deeper level. And, every chapter also includes a short and vigorous story from Rosies own magical experiences. 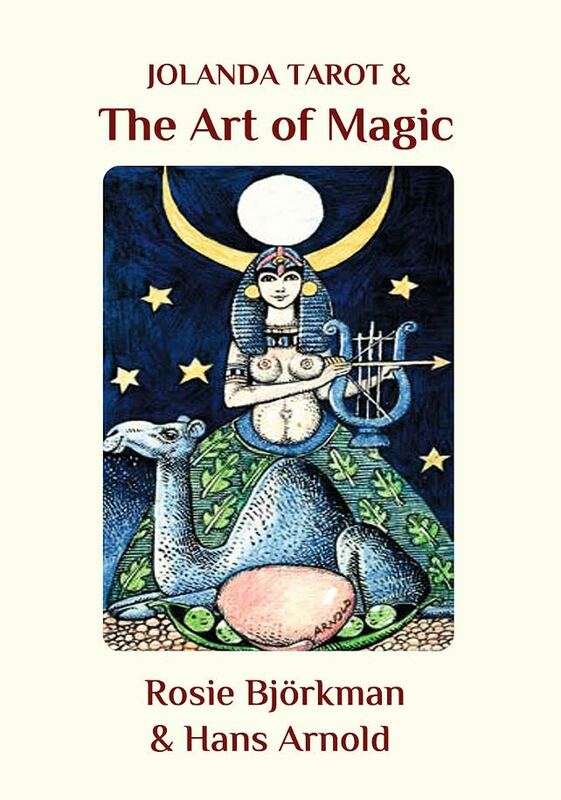 All material in the book is carefully selected to give the reader maximal understanding of the different energies described by the Tarot. 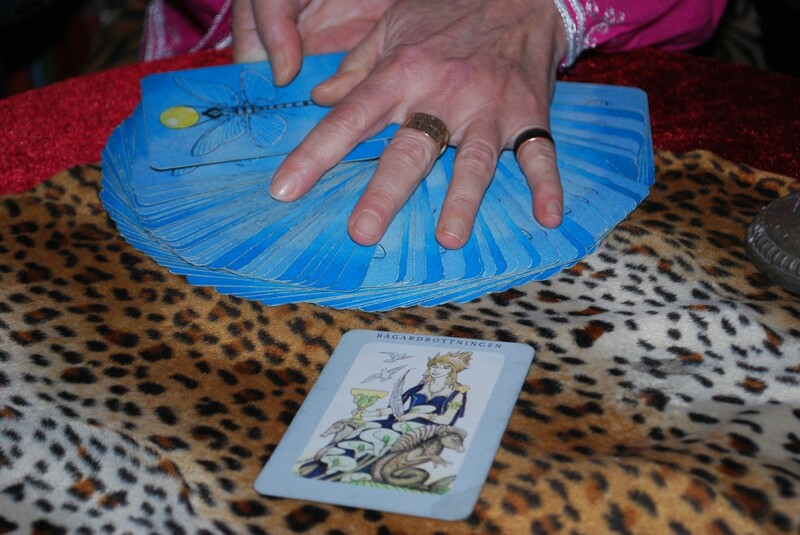 Tarot is a deck of 78 cards, divided into two different groups. 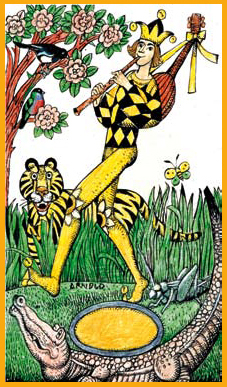 The major arcana consists of 22 cards numbered 0 - 21. 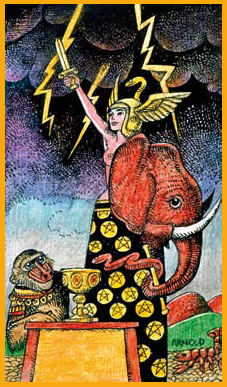 They are the archetypes, the great powers of the Universe, the movement of the planets.The minor arcana consists of four families, swords, wands, coins and cups. the queen and the prince, there is also the princess. The power of the subconscious mind to predict coming events is no more complicated than the weatherpredictions we've grown accustomed to. No human has to act like a lost and blind victim of circumstance stumbling into a future pre-set by some foggy forces of destiny. The tarot is a magical alphabet definitely accessible to anyone who wants to learn how to read it. It is no more difficult to learn than to learn any other foreign language. When we learn how to read the symbols, we at the same time learn how to read the sacred life codes in the human book of life. In this beliefsystem it is taught, that we as humans carry the memory from all times, past, present and future, inside the reptile-brain as well as and the cellular memory, the DNA of the physical body. The different symbolism depicted in the tarotcards are keys that opens passageways into this inner memorybank. One could say that it's the harddisk of the collective human mind, situated inside each and every one of us. The symbols of the tarotcards functions like the symbols of the icons on the computerscreen. One click will lead us to futher informatin consealed behind the icon. The cards can be used to communicate what’s going on in ones life both inwardly and outwardly, with humor and clearsightedness. Slowly, with time and perserverance, one will get to know oneself on a deeper level, and alas! also get to know others. It is also possible to create a sense of foresight into the future. The Elders have quite an interesting answer to that question. They say: ‘ There is no meaning. Life is the Great Spirits way of making itself to all forms of life. The intention of the Great Spirit is to discover him/her-self. Ponder this, the humans are little cells in the cosmic body of the Great Spirit. If this is the case, then we all must share this intention. We’re simply here to find out who we are. Welcome to a dance around the wheel of life! Keywords: Humour, folly, trust, freedom of choice, innocence, commedia del Arte. The meaning: Pure impuls, no awareness of consequence. Release your fears and step into the trust and innocence of the magic child within. Use humour, fun and laughter to resolve any conflict. Follow your gutfeeling. Reversed: The Trickster. Foul play. Meditation: With every thought that pops up in your mind, try to figure out what might be the opposite of it. This will lead to the ability to think free, unlimited thoughts. Keywords: Intellect, presence of mind, concentration, willpower, analysis. Coulors: Yellow, pale violet, silver, gray. Meaning: The power of will to manifest needs. You've got all the tools you need to get started. One step at the time will take you to your goal. Meditation: Visualize your 'head-office' with all them little gray braincells. See yourself like a tiny cleaning lady, cleaning all the cells with liquid crystal. Meanwhile, breeth in nice fresh air/wind. Continue until your headoffice is thoroughly cleansed. Keywords: Intuition, psychic abilities, bodyknowing, spirituality, the Oracle. Meaning: Stay open and receptive to receive hidden messages from the subconscious. The solution you seek will come from within. Acknowledge the power of passive creation. Reversed: Unseeing. Obtrusive. Loss of memory. Meditation: Before you go to sleep, ask for a healing dreamexperience. When you wake up, write down what you can remember from the dream in your dreamjournal. Someday it might prove to be useful information. 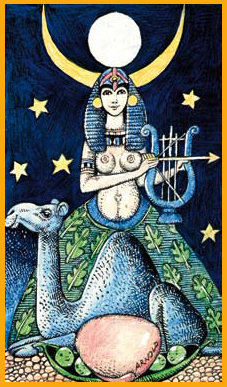 Keywords: Motherhood, pregnancy, abundance, growth, harmony. 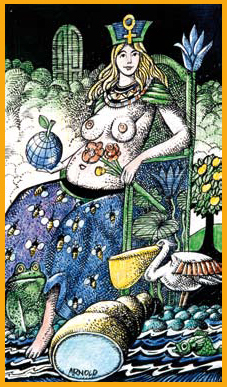 Meaning: The great mother Earth with her fertile soil posesses the knowing of how to manifest what the body needs for basic survival. She is the protector of security and domestic affairs. Have trust in your own ability to provide the necessities. Meditation: Take a walk in a forest. Talk to the nature spirits. Put your hands in the soil. Plant seeds for the future.